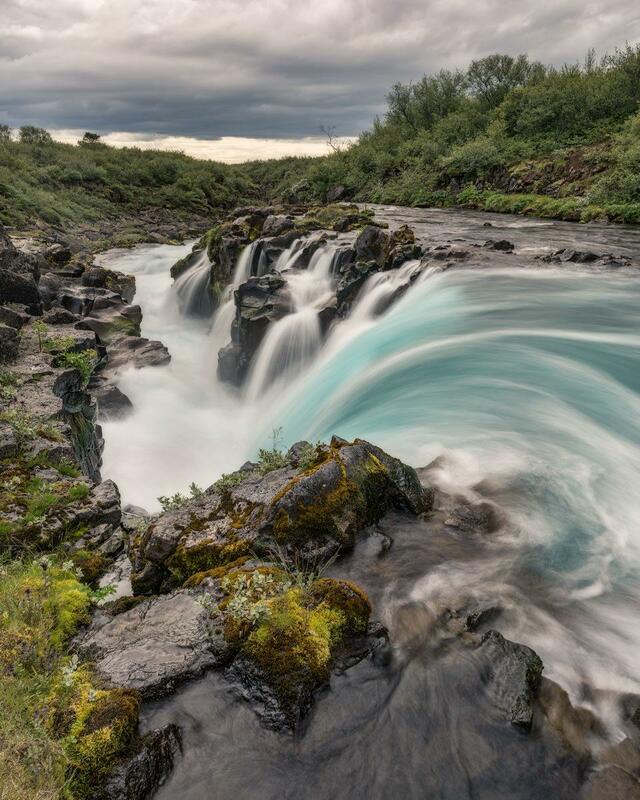 Even before I first visited Iceland, last Autumn, Bruarfoss was very high on the list of the places I wanted to visit. So I was very excited when I realised the Wild Photography Holidays summer workshop included a stay at Gulfoss, less than half an hour's drive from Bruarfoss. Jan and I had a couple of days in which to drive over to Höfn to meet our guests, so we had time to do a little exploring. I had read many reports of how hard it was actually to find Bruarfoss but Google Maps seemed to think it could get us there so off we drove! The nominated road took us up a rough and bumpy track, in amongst various holiday homes and, as we got closer to our destination, so Google got increasingly confused about where we could actually drive. It seemed all the reviews were correct but, after much toing and froing, in pouring rain, we reckoned we'd driven as close as we could get. Roll on the best part of three weeks and I found myself passing the River Bruar again, this time with Rob, who had joined me for a week's holiday after the workshop had ended. 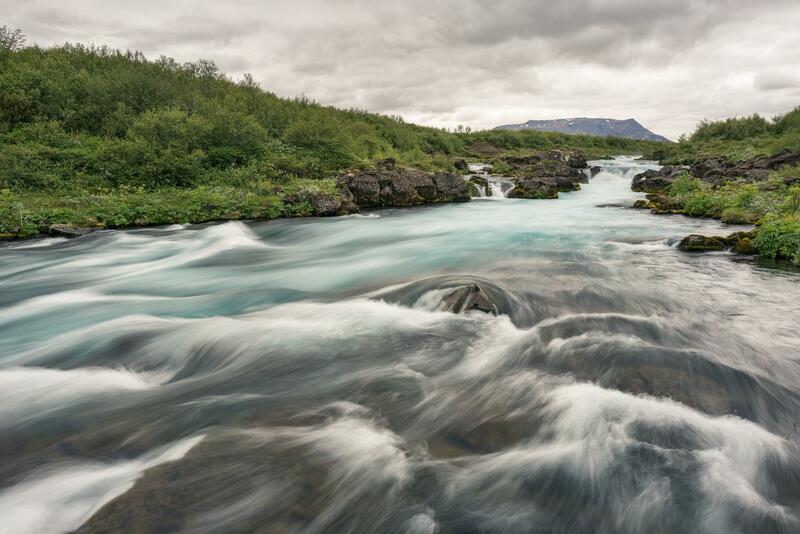 Bruarfoss here we come! As per instructions on the sign at the access bridge, we parked by the river at the main road and headed off on foot. There was a definite path so it all looked promising. Flying insects aside, it was a rather pleasant walk, starting in a field of horses, but gradually becoming more wild, with dwarf willow and birch and a whole host of flowers lining the river. After a couple of kilometres or so, we started to come across faster stretches of river, the water an incredible and intense azure colour. 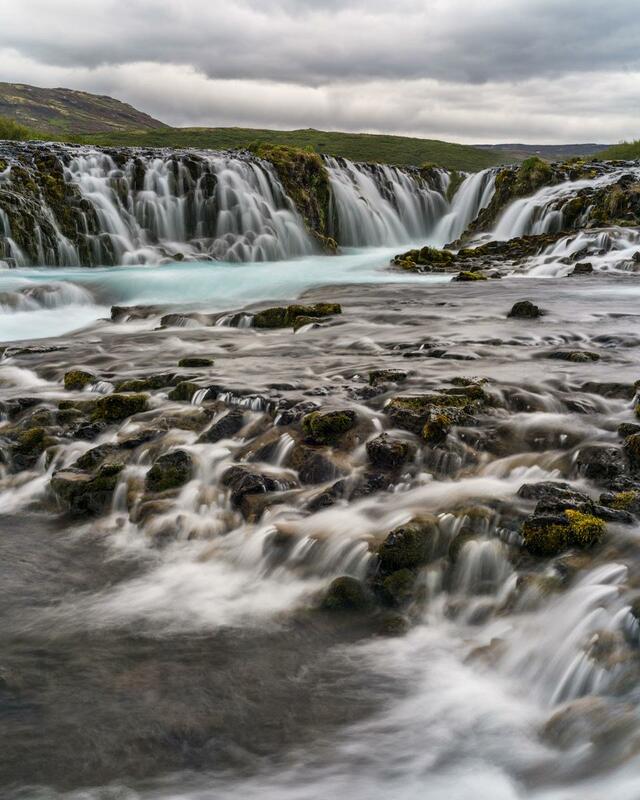 Next a very impressive and picturesque waterfall, clearly not Bruarfoss, but a wonderful surprise discovery. A wooden sign gave me the name - Hlauptungufoss. 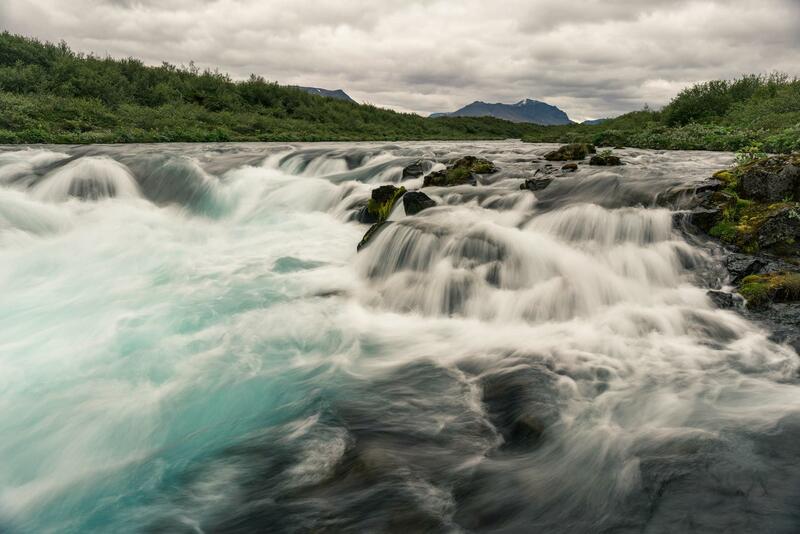 The furious flow of blue water was mesmerising, not to mention the beautifully sculpted rocks on the river bank. 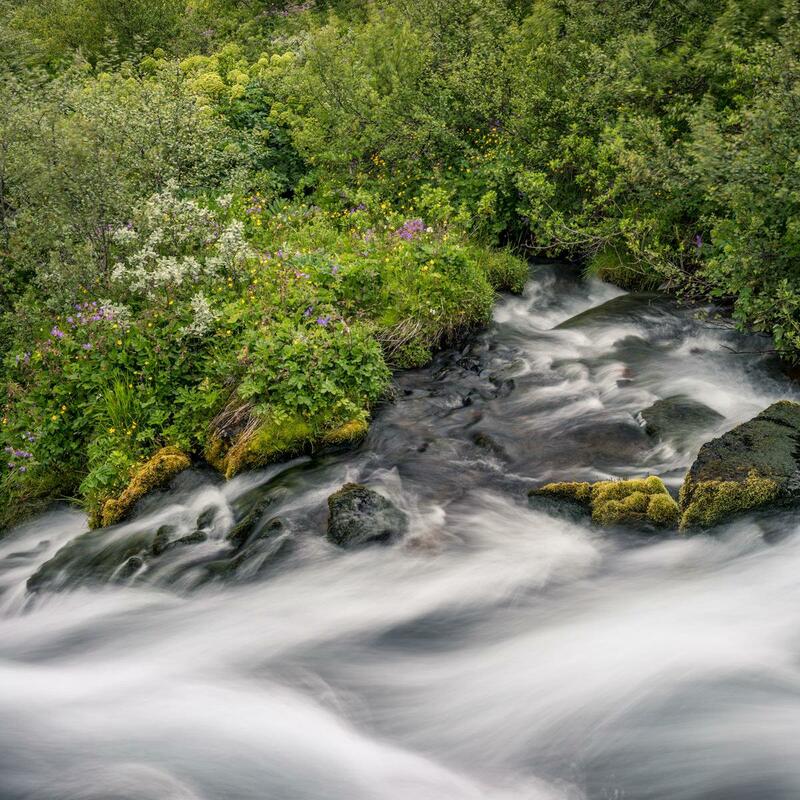 A little further upstream, we came across another - Midfoss - not quite as impressive, but still very photogenic. The path was quite tricky at times, a bit muddy and I'm sure further than 3 km. Eventually, we were forced into a right hand turn, up a little tributary. We could see people and signs ahead so this looked promising. Getting closer, however, I realised that our walk had brought us right back to the sign and barrier Jan and I had found a few weeks earlier. It seemed we'd been led a merry dance… Having spent the best part of an hour walking upstream, trying to do as per instruction, we were not inclined to obey the sign, particularly as we could see other people heading across the access bridge. Rightly or wrongly, across we went and followed a well worn path to Bruarfoss. At last! It was very satisfying to have found the falls - yet again, beautiful and photogenic in equal measures. That said, in some ways I enjoyed the two earlier waterfalls (in the first four pictures) that much more. Perhaps because they came with more of a sense of surprise and discovery? Or perhaps because the water was more obviously that intense blue with the current level of water? 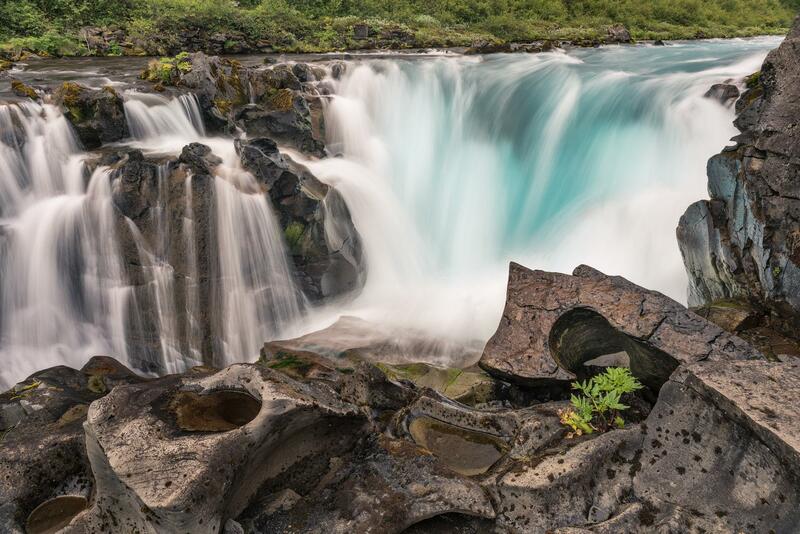 I can imagine Bruarfoss would look particularly wonderful in Autumn. I'm a bit bemused by the situation at the access bridge - someone clearly doesn't want people to visit the falls but there was a well worn path and what looked like official wooden signs, pointing you in that direction. Either way, I was really pleased we'd taken the long route, walking up the river, and enjoying the beautiful scenery and vegetation en route.